Professor Mark P. Strasser is the Trustees Professor of Law at Capital University Law School. This appointment recognizes Professor Strasser's extraordinary and sustained commitment to legal scholarship. 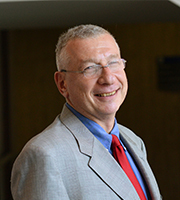 Nationally recognized for his scholarship in family law, Professor Strasser is the author of numerous books and articles in the areas of family law, bioethics, and constitutional law and frequently presents papers at conferences across the country and internationally.